Situated high in Morocco's Rif Mountains, the bohemian town of Chefchaouen is renowned for its stunning scenery, artistic atmosphere and unique, blue-painted walls. Clear mountain light fills the cobbled streets of the medina, whose sky blue buildings stand out in breathtaking contrast to the peaks ranked across the distant horizon. Chefchaouen has long been a must-visit destination for backpackers (thanks in large part to the ready availability of Moroccan kif, or marijuana, which is grown in the surrounding mountains). More recently, tourists of all kinds have begun to flock to the town, drawn by its laid-back atmosphere and considerable rural charm. Chefchaouen's history is closely linked to its proximity to southern Europe. The town was founded in 1471 as a kasbah, or fortress, intended to ward off Portuguese invasions from the north. After the Spanish Reconquista, the kasbah grew in size with the arrival of Spanish settlers - many of them Muslims and Jews who had been forced to convert to Christianity and were later exiled from the Spanish mainland. In 1920, the town was incorporated into Spanish Morocco, and only regained independence with the rest of the country in 1956. Today, it remains a popular vacation spot for visitors from the Spanish enclave of Ceuta, located on Morocco's most northern tip. 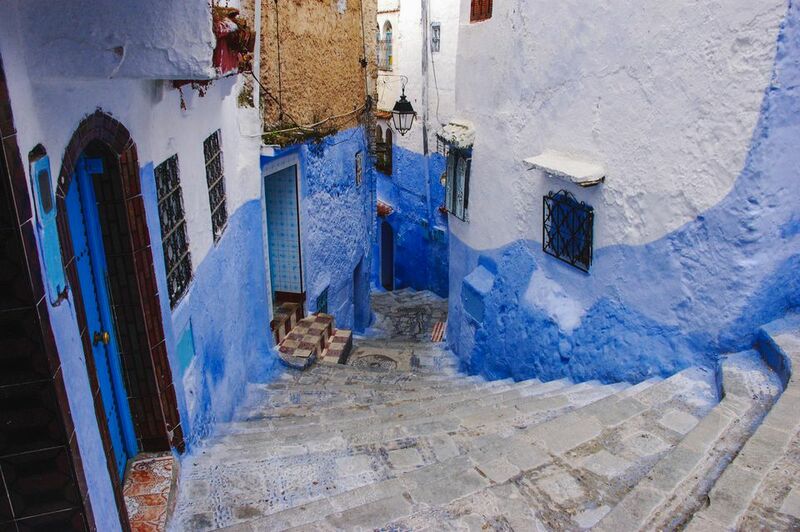 There are many theories behind the distinctive color of Chefchaouen's streets. Some believe that the buildings were originally painted blue to repel mosquitoes, while others theorize that the tradition began with the Jewish refugees that settled there during the Spanish Reconquista. It is thought that they chose to paint their homes in shades of blue in accordance with Jewish custom, which sees the color blue as a symbol of spirituality and a reminder of the sky and Heaven. The custom became increasingly widespread in the mid-20th century, as more Jews fled to Chefchaouen to escape persecution during the Second World War. Most visitors come to Chefchaouen to unwind after a visit to Morocco's frenetic Imperial Cities (including Marrakesh, Fez, Meknes and Rabat). The medina is peaceful and authentic, offering a rare opportunity to wander, take photographs and soak up the atmosphere without being hassled by over-enthusiastic street vendors or tour touts. Most of the action centers around the central square, Plaza Uta el-Hammam. Here, you can admire the restored kasbah, the 15th-century Grande Mosquée and the ramparts of the medina walls. In between, stop for a glass of refreshing mint tea or sample regional cuisine at one of the plaza's many street stalls or restaurants. Shopping is particularly rewarding in this scenic mountain town. Instead of the identikit trinkets and souvenirs offered in the larger cities, Chefchaouen's shops and stalls specialize in local arts and crafts. Woollen and cotton clothing, woven blankets, quirky jewelry and regionally produced goats cheese are all typical wares in Chefchaouen. The shopkeepers are friendly and relaxed, and the starting prices are generally reasonable (although haggling, as with everywhere else in Morocco, is expected). When you tire of shopping, hire a local guide for a hike through the beautiful surrounding countryside. In particular, make sure to visit nearby Ras el-Maa waterfall. Visitors to Chefchaouen are spoiled for choice in terms of places to stay, with options ranging from budget-friendly backpacker hostels to luxurious riads. Those looking for accommodation at the cheaper end of the scale should consider Casa Amina, a beautiful and authentically decorated hostel located within easy walking distance of the kasbah and central square. There are four rooms to choose from, including one private room and three designed to sleep up to three people. There's a communal kitchen for self-catering purposes, and two shared bathrooms. Recommended mid-range options include Casa Sabila and Casa Perleta. The former is a renovated Moorish home with a rooftop terrace and impressive mountain views. The latter is a traditional Andalusian house located in the heart of the medina. Both offer an included Moroccan breakfast in addition to free WiFi, air-conditioning and private ensuite bathrooms. For a touch of luxury, try the 5-star Lina Ryad & Spa, an enclave of peace and quiet with mesmerizing terrace views, sumptuous suites and delicious cuisine. The spa includes a heated indoor pool and a traditional Moroccan hammam. Chefchaouen's cuisine is typical of the rest of Morocco, with local favorites including fragrant tagines and skewers of grilled meat cooked over an open fire in the medina. For a truly memorable dining experience, make sure to visit Tissemlal, the restaurant of Casa Hassan hotel - a local landmark known for its high-quality traditional Moroccan dishes. Here, lanterns, candles and an open fireplace help to set the mood for a special occasion. Restaurant Beldi Bab Ssour is a budget-friendly Moroccan favorite with a cerulean-painted courtyard and a healthy menu featuring several vegetarian and vegan options; while Pizzeria Mandala is your go-to when craving Western fare. The easiest way to get to Chefchaouen is by bus, with daily services departing from Fez (5 hours), Tangier (4 hours), Tetouan (1.5 hours), Casablanca (6 hours) and Rabat (5 hours). Most are operated by national bus company CTM. All buses arrive at a small station located a 15-minute walk from the medina, which can also be accessed via taxi. Since the walk from the station to the medina is largely uphill, a taxi is often a welcome alternative for those with reduced mobility or lots of luggage. When leaving Chefchaouen, be aware that very few buses originate in the town and as a result, most will have limited space by the time they reach it. If possible, try to purchase your ticket a day in advance.